Baby Bear is the final quanket in my Three Bears series, and I am thrilled to have it finished in time to include it, along with Papa and Mama Bear, in this year’s Hands2Help Charity Quilt Challenge. I have had little time to spend at the sewing machine over the past few months, however I did take some time recently to better organize my scraps. While I am not quite as organized as other quilters in cutting my scraps into commonly used sizes, I do keep my scraps together by colors. My prior method of keeping them in plastic bags was beginning to get out of hand and needless to say, it looked tacky. So I purchased some cute photo boxes that were on clearance, and have now organized my scraps into these. They look much cuter on the shelf and work much better than the plastic bags did. During the process of organizing, I found that my blue scraps were overflowing, which is what inspired the fabric selection for Baby Bear. Designing a scrappy quilt, while challenging, is fun and rewarding. Challenges include finding enough scraps in similar or complementary color values and/or saturation, and designing the layout. For me, the layout is usually dictated by the amount of scraps I have that work together. In Baby Bear, I had a lot of country blues – leftovers from the 80’s – and darker blue leftovers from my quanket, Celebration. Using a design wall is great for exploring options in how to arrange blocks, sashing and borders. My design wall is a closet door covered with felt which works great, as it lets me place pieces without the use of pins. For pieces that have more seams, it seems that a pin is needed, otherwise I end up with a pile of pieces on the floor in front of the closet door! Mama Bear began with a color idea that I saw in an Indian Sari. Indian Saris are beautiful and their colors are so inspiring. I love the combination of purple, orange and pink. And while I try to do different quilt designs as much as possible, I wanted to do another Bear’s Paw quilt to go with Papa Bear. Another source of inspiration for Mama Bear began this past Thanksgiving. At the cabin we stayed at in Big Bear for Thanksgiving, there is one bedroom that is decorated in the Three Bears theme – how fun is that? Since Thanksgiving, I have had the plan to do three Bear’s Paw quilts: Papa Bear, Mama Bear and Baby Bear. Baby Bear is up next! This quanket, along with Baby Bear and Papa Bear are being donated via the Hands2Help Challenge 2016 and will go to the Yukon Women’s Transition Home in Whitehorse, Yukon. I am inspired by these words on their website, “Kids deserve to feel safe“. These are words that fuel me to make and donate quilts for kids. 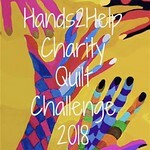 I recently read a quilter’s comment that there are “so many quilts to try and so little time“, which I can totally relate to! Papa Bear marks my 57th quilt donation – not counting the numerous family and friends quilts I have made over the years – and this is the first time I have done a Bear’s Paw quilt design. The inspiration for the name and color palette came from a family trip to Big Bear over the Thanksgiving holiday: the crisp blue sky, the evergreen pine trees and the snow that fell all day on Friday. Living in Southern California, it is a treat to be able to drive only a few hours and to enjoy a few days in the snow. Yes, we are spoiled. The majority of the fabrics were pulled from my scraps bin and represent too many past projects and pieces of the past to list here. Overall, there is a lot of good mojo that is at work in this quilt! This quanket, along with Baby Bear and Mama Bear are being donated via the Hands2Help Challenge 2016 and will go to the Yukon Women’s Transition Home in Whitehorse, Yukon. I am inspired by these words on their website, “Kids deserve to feel safe“. These are words that fuel me to make and donate quilts for kids.